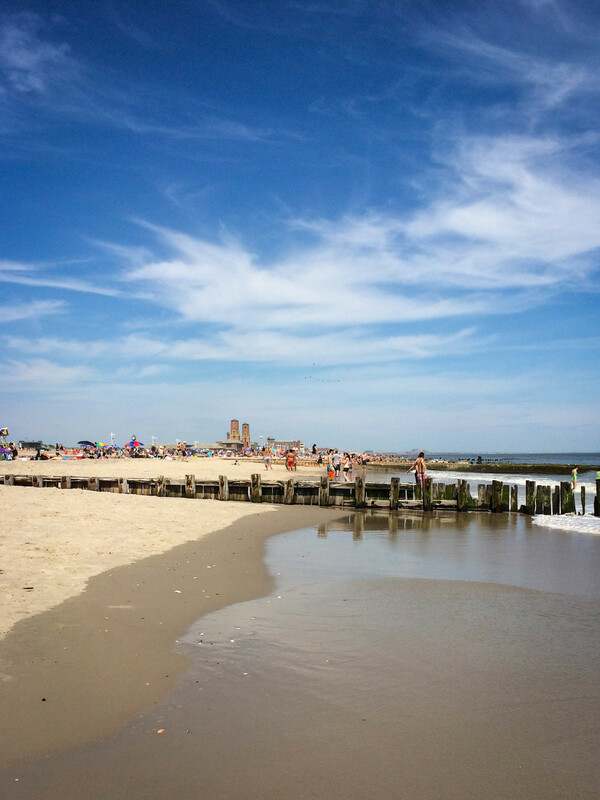 I biked to The Rockaways on Memorial Day, it was a glorious way to start the unofficial summer season. The boy and I biked from our apartment in Cobble Hill to the Q train, then took that to Sheepshead Bay and proceeded to bike to the beach from there. We met up with a few friends and spent some time in the sun and sand. The water was still ice cold, so maybe I'll go swimming for real next month when it is officially summer. Beautiful blue skies and not many people. Also pardon the iphone photos, didn't want sand in my DSLR, ya know? In my kitchen, the capstone of the summer produce season is defined by an abundance of 1. corn 2. tomatoes and 3. stone fruits. We're not quite there yet, but you can buy fresh corn in all of their husk-y glory which is a huge step forward from the beginning of this year. I will be absolutely ecstatic once we start getting peaches, plums, and fresh heirloom tomatoes. Until then, I'm taking full advantage of my favorite non-vegetable vegetable. I used to make chicken corn chowder periodically in college. However, since adopting my eating-less-meat lifestyle a few years ago, I have found that roasted poblanos are also a great complement to sweet corn. It's no substitute for meat, but it's not trying to be, it simply adds a wonderful depth of flavor that you can't get with corn alone. Depending on the time of year and the corn you buy, you can add a tablespoon or two of sugar/honey if the corn isn't sweet enough. I know it almost seems like cheating, but hey, all that matters is you loving the food you make. If you like your chowder really thick and creamy, you can reduce the amount of water to 6 cups instead of 2 quarts (8 cups). 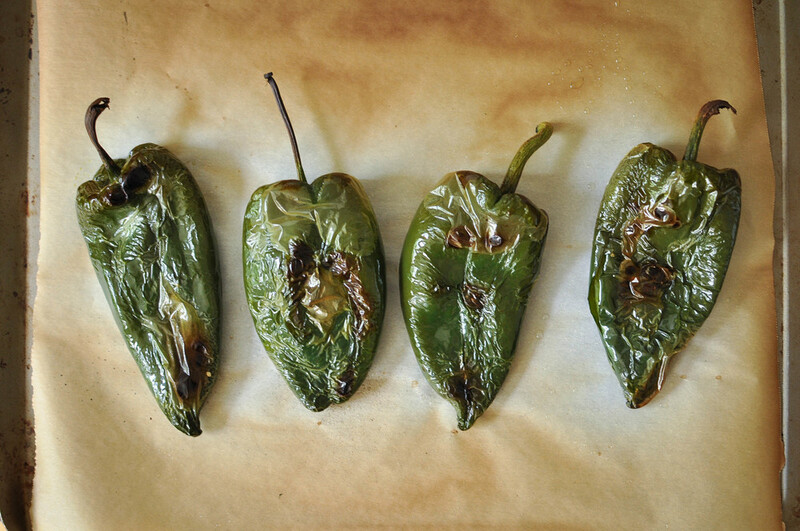 Preheat oven to 450 degrees F. Rub olive oil onto poblano peppers until all surfaces are covered. Place peppers on a parchment paper lined baking sheet and roast for 15 minutes until skin is charred and peppers have softened. Take peppers out of oven and immediately transfer to a bowl, cover, and let cool. Meanwhile, to make the corn stock, place corn cobs, half the kernels, and water in a large pot. Bring to a boil, turn down heat to low, and simmer uncovered for 30 minutes. Fish cobs out and discard. Transfer liquid and kernels to a blender and blend until smooth. Strain through a fine mesh sieve, discard solids and set stock aside. In a large dutch oven, heat up butter on medium-high. Add garlic and shallots, and cook for 2 minutes until translucent. Add flour, whisk until smooth, and continue cooking for 1 minute. Add corn stock a cup at a time, whisking well after each addition. After you have added about half the stock, you can add the second half in one fell swoop and whisk to combine. Add the remaining corn kernels, potatoes, and salt. Bring soup to a boil, turn down heat to medium low and simmer uncovered for 30 minutes. While soup is simmering, peel poblanos and remove seeds. Sprinkle with a little salt and cut into small dice. To the soup add heavy cream, stir to combine, then turn off heat. Let rest for 10 minutes, the soup will get slightly thicker as it cools. Ladle into bowls, top with some roasted poblano, sprinkle with optional toppings and serve.